Welcome to my new column Sin Jawns Style, where I profile local humans with a style that I admire. The first person I am profiling is Lisa Walters, an aesthetically-pleasing person, and hilarious blogger. I first met Lisa around eight years ago through mutual friends, and in that time she has become a blogger you will make you laugh, cry, learn, and probably make you feel like she is your best friend. Here is what she had to say about her personal style. Good question! I don’t really know how to describe it because it really changes depending on my mood. Sometimes I dress super casual (like sweat pants casual) and sometimes I will wear a long whimsical dress to just go to the mall. One thing I do love doing is matching my outfits to my mobility aids. 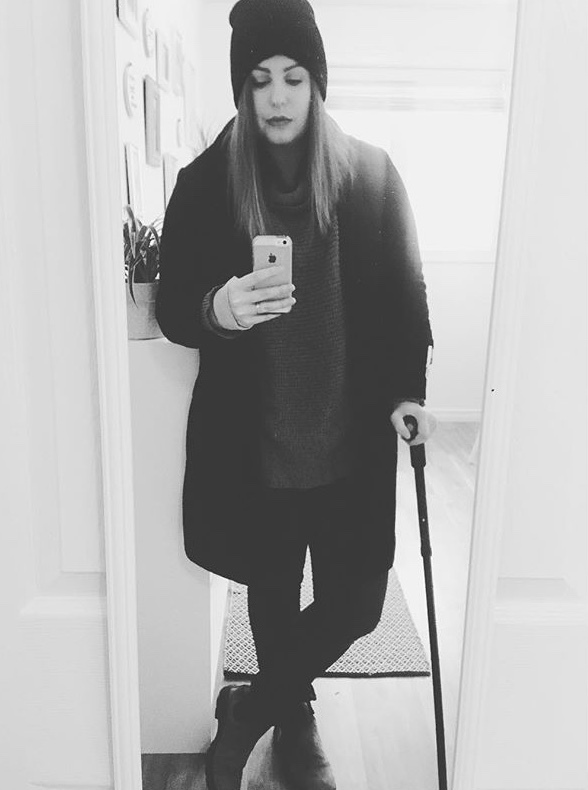 I use canes, crutches and now a rollator to get around because I have Ehlers-Danlos syndrome, and I love being playful with my mobility aids and incorporating them into my outfit as if they are a stylish accessory. Who or what influences your aesthetic? Usually, if I become obsessed with a tv show or movie, there’s a character whose aesthetic I will then try to copy. I’m not a very original person. As a teenager, I just wanted to look like Veronica Mars, and throughout most of my twenties, I was just channelling Jessica Day from New Girl. I loved her whimsical style, but I’m sort of growing apart from it now. These days a lot of my style is based around comfort because that aforementioned illness means I spend a lot of time at home resting. 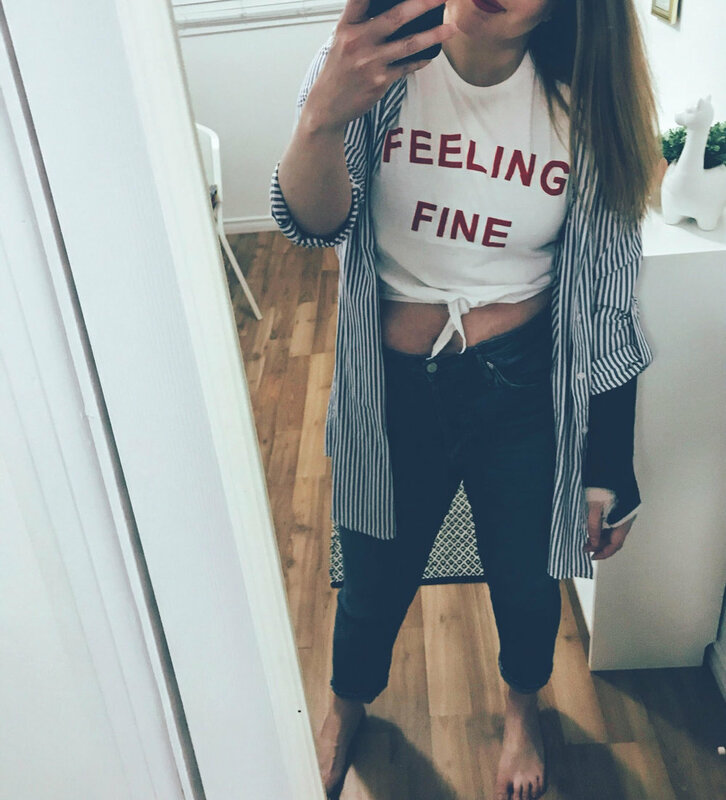 So usually I try to find clothes that are both comfy and stylish. I will wear sweat pants, but I usually wear ones from Rw&Co or The Gap that are just fancy enough to be dressed up if need be. I’m also watching a lot of Nordic Noir shows lately so I basically dress 80% of the time like a Scandinavian detective. Like I said - I’m not very original. How has your style changed over the last 5 years? Probably the biggest change in my style over the last 5 years has been around the idea of comfort. I used to wear heels on a fairly regular basis because style mattered more than comfort, but I sold most of them when my leg muscles started objecting to walking. I still have a few pairs, and now my plan is to just wear them when I’m using my wheelchair because I get to have the cuteness of my shoes without the pain of walking in them! So I used to wear a lot more dresses, skirts and heels. And now I’m more of a jeans and Blundstones kind of girl. The dressing up doesn’t happen as much anymore because that takes energy. I still do it on occasion because I will have a long stretch of being stuck in bed and then one day I will wake up with a bit of energy and naturally use it all up on superficial things like doing my hair and makeup and putting on a cute outfit. And then I’m tired again and get to look super stylish when I return to my bed. One of my chronic illness friends on Instagram actually started a hashtag for that very phenomenon called #LayingButSlaying. So I try to get some good #LayingButSlaying in when I can. No matter how sick I am I will always be very vain, it seems. And on the days when I just don’t have the energy to feed my vanity, my Blundstones and baggy sweaters will always be there for me. What are your five key style essentials? 1) Levi’s super high-waisted jeans. Can’t live without a pair. 2) My Blundstones. They go with so many outfits, or at least in my head they do, and they are comfortable and durable so I’m less likely to die from leg pain when I wear them. 3) A coat that looks like an oversized sweater. I have two (one in grey and one in black) and they are both from The Boathouse. They go with everything and are great in practically all seasons which is important here because you never know what the weather will be like throughout the day). 4) I wear a lot of baggy toques. It’s partially a style thing and partially an “I’m too tired or lazy to wash my hair so I’m going to hide it” thing. 5) A sweater dress. I wear a lot of black and grey sweater dresses over jeans - both skinny jeans and baggy ripped up mom jeans. It’s probably not socially acceptable but it’s my favourite thing to do so no one will ever stop me. I’m starting to see a lot of that look on sites like H&M now though, so maybe I’m in the clear. But also maybe no one thinks anything from H&M is actually stylish? I’m very out of the loop. Probably my Blundstones, my ripped up jeans, my black knit sweater dress that comes to my knees, my grey Boathouse sweater coat thing, and my burgundy baggy hat. It might get uncomfortable in the summer but we have a very short summer so I could make do. That’s my go-to look. It’s what I feel most comfortable and most myself in. When did you first realize that you had a unique style? As far back as high school, I was always called “unique” and I absolutely loathed the word. While everyone was wearing ball gowns to our prom, I wore a knee-length bronze cocktail dress and I heard the word “unique” probably a hundred times that day. I don’t hate the word anymore. I’ve embraced it. But I knew from a pretty young age that my style was different and it’s mostly because I’ve never really cared to make sure I’m wearing the same sort of outfits as most of my peers. I find something I like and I wear it. It doesn’t matter if other people like it. What is your favourite outfit you have ever worn and why? I’m going to have to say my wedding dress. I absolutely adore my wedding dress and I’m still patting myself on the back for picking such a good one. I’ve never loved most wedding dresses I’ve seen around here. I wanted something a bit different. So I went to Ever After and bought a blush pink strapless gown from Willowby by Watters. And then I went on bhldn.com which I recommend to anyone who is ever looking for wedding dresses, accessories, even decor. It’s the Anthropologie wedding site. So I went on there and I ordered a bedazzled top with sleeves to wear over my dress. 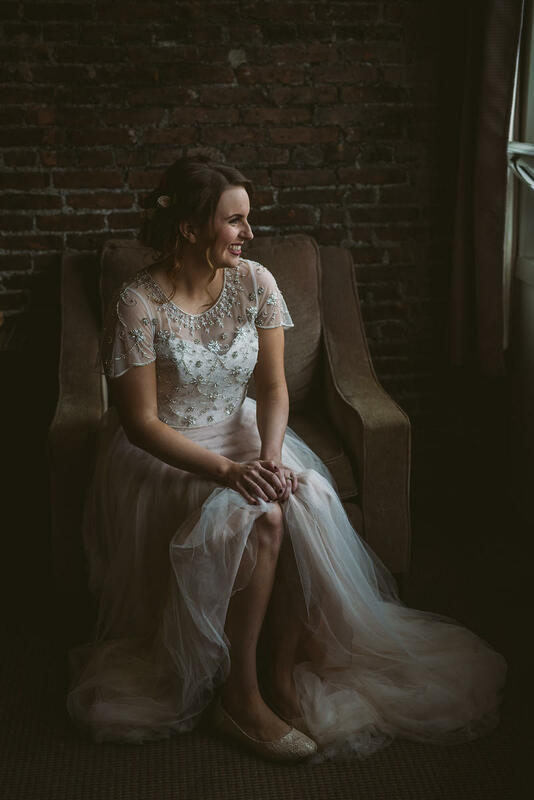 It was a bit of a hassle getting my dress tailored to make the top look like it was meant to be part of my dress, the bodice of my gown had a lot of lace detail that had to be removed further down my dress. But we managed and I’m so glad I put the gown and top together. I don’t like strapless things and knew I would be super self-conscious the entire day if I didn’t have sleeves, so this made me very comfortable. I also had gold flats from Mod Cloth that said “just married” on the back of them. Such a wonderful outfit. I felt like a princess. What are you trying to communicate to the world with your style? Probably the most important thing I’m trying to communicate with my style is that mobility aids can be stylish accessories and disability doesn’t have to be ugly or just for senior citizens. You can have fun with it! By having different coloured mobility aids and matching them to my outfits I’m trying to help erase that stigma that disability should be something hidden and something you can’t proudly display. For a long time, most mobility aids have been marketed to seniors because people have been ignoring that anyone of any age can have a disability. 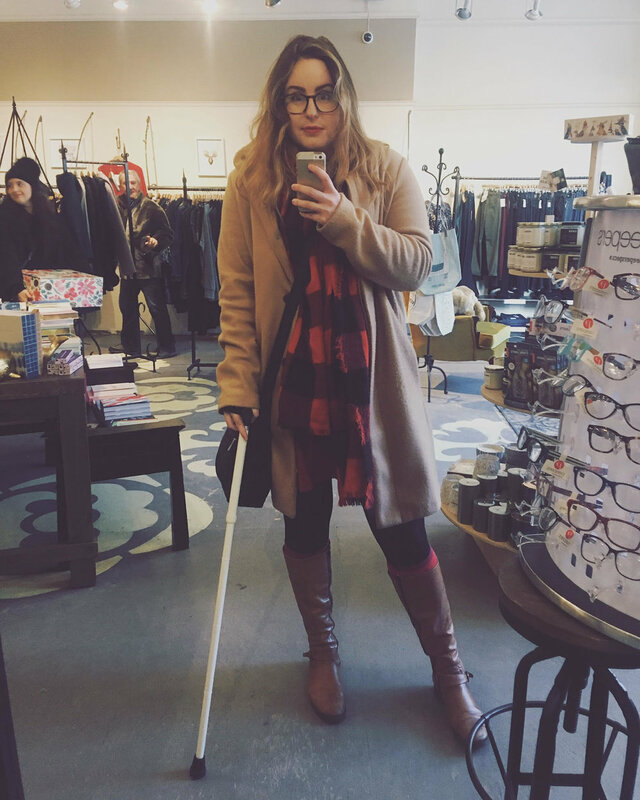 Now it seems like the world is starting to embrace that more (thanks to celebrities like Selma Blair who rocked a blinged out cane at The Oscars) so I want to do my part to show people that younger people can be disabled too, and we can make it fashionable. For more about Lisa, you can follow her on Instagram @damselinadress.blog, Twitter @MSorsomething, and Facebook, and you can read her blog at www.damselinadress.ca. I highly recommend doing all of these activities.